Over the last decade, Pitt construction and renovations have added state-of-the-art facilities for research in medicine, science, engineering, and technology. Pitt students don’t have to go to Hollywood to learn about film. Pitt’s Film Studies Program and Pitt in Hollywood organization cover practical as well as academic aspects of filmmaking. Students know that rubbing the panther statue’s nose brings good luck on exams. Learn about that and other Pitt traditions. The 29 Nationality Classrooms in Pitt’s Cathedral of Learning depict, and were donated by, the peoples who helped to build Pittsburgh. From research funding to international studies to the happiness of its students, Pitt ranks among the best in higher education. On a sunny day in Pittsburgh, automobiles convey baseball fans across the St. Pierre Bridge to Forbes Field. It’s a remarkable scene (and no cracks about the rarity of sunny days in Pittsburgh). Before he brought a muscular new dancing style to Hollywood musicals, Gene Kelly was a Pitt economics major who supported himself by pumping gas, digging ditches, and teaching at his family’s dance studios. From polio to cancer, Pitt researchers have a long history of fighting, and beating, deadly illnesses. Pitt’s Center for Vaccine Research continues the battle. From a luxurious hotel that became a student union to a gleaming tower for biomedical sciences, Pitt buildings demonstrate a diversity of history and design. Open to campus religious groups of all denominations, as well as the public, Pitt’s Heinz Memorial Chapel is a popular site for guided tours, weddings, and concerts. In 1968, when the University Center for International Studies (UCIS) was created as an encompassing framework for all of Pitt’s international programs, it was unique. Today, it’s emulated worldwide. High atop the Cathedral of Learning, a transmitter broadcasts the signal of WPTS-FM, Pitt’s student-run radio station, cofounded by Adrian Cronauer of Good Morning, Vietnam fame. Pitt’s first-of-its-kind Department of Critical Care Medicine (CCM) trains intensivists—physicians who specialize in treating critically ill patients in intensive care units. Pitt researchers are using robotics and virtual reality in projects ranging from helping the military control unmanned aerial vehicles to creating simulations of ancient temples. One of Pitt’s missions is getting health information and resources out into the community for use in fighting diseases and developing policy. Pick a disease. Let’s say you understand its mechanism. A logical way to treat it would be with a drug. But of millions of drugs available, how might you find one that works, or create a new one? Students study and conduct research from Beijing to Buenos Aires—becoming part of the neighborhoods where they live—through the Pitt Multi-region Academic Program (PittMAP). A Pitt professor and an alumnus were two of only 22 MacArthur Fellows selected nationwide in 2011. Better known as the “genius” award, the honor includes $500,000 in unrestricted support for each recipient. At the School of Dental Medicine, some researchers come to work every day hoping to make people drool—all to help build what is believed to be the world’s only DNA bank to share data among colleagues. Want to Study Swahili? Acquire Arabic? Want to study Swahili? Improve your Icelandic? If you answered sawa or ja, respectively, Pitt's Less-Commonly-Taught Languages Center (LCTL) can help. “The Honors College provided me with the feel of a small, liberal arts school with all the opportunities of a major research university,” says student Nana Marfo. “The building was to be more than a schoolhouse; it was to be a symbol of the life that Pittsburgh through the years had wanted to live,” Chancellor John G. Bowman wrote of Pitt’s Cathedral of Learning. Pitt staff members don’t just serve the University. Through their volunteer work, they serve the greater Pittsburgh community, too. Hurting? The hormone endorphin will dull the brain’s perception of pain. But while they’re essential to human self-preservation, little was known about hormones when Klaus Hofmann began studying them. 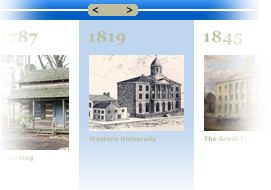 Inspired by The Autobiography of Benjamin Franklin, Thomas A. Mellon decided in 1834 to enroll at the Western University of Pennsylvania rather than try to eke out a living on his family’s farm. Some 1,500 strong and wearing yellow T-shirts blaring the “Oakland Zoo” logo, Pitt’s student fan section encircles the Petersen Events Center’s lower level during home basketball games. Between the Cathedral of Learning and Heinz Chapel is a sidewalk called the Varsity Walk, where the names of outstanding Pitt student-athletes are embedded in the stones. From the ceiling of Pitt’s Wesley W. Posvar Hall hangs one of the first heavier-than-air craft to achieve a sustained flight. Pitt alumnus Holmes Rolston III’s work in environmental ethics has brought him face-to-face with mountain gorillas in Uganda and with Britain’s Prince Philip in Buckingham Palace. “I never knew that learning science could be so much fun!” one student said following a visit to her school by Pitt’s Mobile Science Lab, a truck equipped as a laboratory. A simple, inexpensive filter that removes arsenic from drinking water is saving lives in Bangladesh, the home country of the filter’s inventor, Pitt alumnus Abul Hussam. Children with autism often have problems with metaphors and make-believe. “I don’t play with things that aren’t real,” one autistic child told Pitt neuroscientist Nancy Minshew. Health law. Child welfare and literacy services. Business consulting. Pitt community outreach centers and clinics provide those services and more. Whether assisting budding authors with their creative writing or introducing high school students to health care delivery systems, Pitt academies and institutes engage students of all ages. Pitt graduate Vladimir Zworykin is often called “the father of television." His research also led to the development of the electron microscope and night-seeing infrared devices. Sweeeet Car-o-line! LET'S GO PITT! Watch as students contribute to a variety of community projects, including cleanups, renovations, yard work, and carpentry, during the annual Pitt Make a Difference Day. See how Pitt fraternities and sororities encourage students to engage socially and professionally, as they forge relationships that often extend far beyond graduation. Enjoy a history-in-pictures video about Pitt students, from the 1880s to the present day. In 1964, a Pitt team led by professor P.G. Katsoyannis synthesized a protein for the first time. The protein was insulin, and Pitt’s biochemical feat has proved a lifesaver for millions of diabetics. Maud Menten's research helped to lay the groundwork for modern drug therapy and biochemistry. Pitt’s Bruce Hall, Croghan-Schenley Room, Early American Nationality Room, and William Pitt Union are all haunted by ghosts, they say. Who are “they,” you ask? Don’t ask! A Pitt outreach program helps to provide life-saving liver transplants for Amish children suffering from a rare genetic disorder. Issues vital to preserving democratic systems, as well as the Rule of Law upon which those systems depend, are the focus of Pitt institutes and forums devoted to politics and policy. Students and scholars enjoy a window into global economics and politics, thanks to an archive on the creation of the European Union (EU) and several special collections. Established in 1985, Pitt’s Thomas E. Starzl Transplantation Institute (STI) is one of the world’s leading resources dedicated to helping people survive end-stage organ failure. Pitt research in photonics—the science of light—promises to enhance electronic devices ranging from cell phones to spy satellites. With research on tissue engineering, cellular therapies, and medical devices and artificial organs, Pitt scientists don’t just work on the cutting edge of medicine and bioengineering. They sharpen it. Pitt’s student publications include an award-winning newspaper, an academic journal, and magazines publishing everything from avant-garde poetry to analytical essays. Pitt’s success in bioengineering comes from a commitment to thinking creatively about medical issues, and to never losing sight of the fact that these issues start and end in patients’ real lives. By combining medicine with engineering, Pitt scientists and physicians are creating breakthrough devices, including an artificial lung that allows patients’ own lungs to rest during recovery. A soldier injured by an explosive device in Afghanistan lost a significant portion of leg muscle, compromising his strength and range of motion. Until Pitt doctors helped him regrow it. In 2004, Corporal Mike Jernigan lost both his eyes in a roadside blast in Iraq. Pitt ophthalmologists are helping him and others to see again—via their tongues. Toughness. Intelligence. Unselfishness. Consistency. Teamwork. Success. Improvement. Those words describe the Pitt men's basketball program. With those ideals, Jamie Dixon has built a “Tradition of Excellence” on and off the floor. Pitt’s 1908 relocation to Oakland helped transform that neighborhood into the educational and cultural heart of Pittsburgh. Today, new Pitt facilities are helping nearby areas to thrive, too. Pitt’s hometown boasts “a natural setting that rivals Lisbon and San Francisco, a wealth of fine art and architecture, and a quirky sense of humor,” according to National Geographic Traveler magazine. From pioneering new treatments for wounded soldiers to helping veterans earn university degrees, Pitt serves the heroes who serve our country. The success of the Pittsburgh region’s economy, even during the worldwide downturn of the last several years, can largely be attributed to the city’s powerful education and medical sector. Pitt supports tens of thousands of jobs in Pennsylvania, directly and indirectly. Before 1963, there were no institutions of higher education in northwestern or northcentral Pennsylvania. Young people left the area to further their educations and often did not return. Founded in 1963 as a two-year institution in a single building in downtown Greensburg, Pa., Pitt-Greensburg flourishes today as a four-year degree-granting campus serving more than 1,700 students. Celebrating its 85th anniversary in 2012, Pitt-Johnstown is the oldest and largest of the University’s four regional campuses. And it’s growing stronger by the year. Titusville, Pa., (population: about 6,000) tends to punch above its weight: 104 years after giving birth to the oil industry, this residential town became associated with an academic powerhouse—Pitt. Pittsburgh's population is among the country's oldest. In Pitt's Aging Institute, the city also boasts one of the best groups of geriatric researchers in the United States. The number of Pitt innovations that moved from the lab to commercialization increased by 31 percent during the University's 2011 fiscal year, compared with the previous year. Other cities host more than one research university. But only in Pittsburgh are two such institutions literally footsteps apart—Pitt and Carnegie Mellon University. “When I think back to my days in the Pitt Band, I remember a student organization that was filled with pride and spirit and proudly represented the University,” says emeritus trustee J. Roger Glunt. With curiosity as their guide, Pitt undergraduates pursue research in fields ranging from tissue engineering to psychiatric medicine to film directing. Like all living things, cells have a life cycle. But sometimes, certain things—radiation, environmental factors—cause cells not to die, growing unabated into tumors. What then? People crossing the first-floor lobby of Pitt’s Wesley W. Posvar Hall may not realize that an inconspicuous glass block in the floor holds a significant piece of American baseball memorabilia. Dan Marino was a hometown hero who grew up in the shadow of the Cathedral of Learning before going on to stardom at Pitt and the NFL. Many consider him to be the greatest quarterback of all time. John Woodruff helped to tarnish the 1936 Olympic Games in Berlin for Adolf Hitler by winning the gold medal in the 800-meter run. 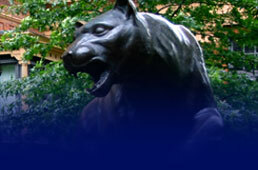 The Panther was adopted as Pitt’s mascot during a meeting of student and alumni leaders in 1909. Organizations that deal with security use knowledge learned from terrorist attacks to prevent, or at least respond to, future ones. Many security personnel look to Pitt for help. Research by Pitt’s Bernard Fisher has extended and improved the lives of many thousands of women suffering from breast cancer, while fundamentally altering understanding of the disease. How will heat transfer from one component to another? What is the most efficient shape for a given part? Before John A. Swanson, engineers had to complete tedious calculations to answer these questions. The father of molecular endocrinology and winner of the 2007 National Medal of Science, Bert O’Malley uncovered the molecular events that allow hormones to influence genes to make proteins. The New York Times has called Pittsburgh a "gleaming cultural oasis." Since 1997, the PITT ARTS program has been helping Pitt students to explore that oasis. Numbered jerseys. Broadcasts of games. Teams traveling by plane. All of these were Pitt football innovations. Legend has it that John Bain “Jock” Sutherland played in the first football game he ever saw. He suffered defeat only once as a player, then went on to coach Pitt to five national championships. On average, African Americans have a lower life expectancy and less access to health care than White Americans do, studies show. Pitt doctors and researchers are working to close this gap. Pitt’s Bobby Grier became the first African American to play in the Sugar Bowl when the Panthers battled Georgia Tech in New Orleans on Jan. 2, 1956. Colorful, cunning, charismatic—and, to opposing fans, often infuriating—Henry Clifford “Doc” Carlson, MD, was an innovative coach who knew how to win and get the most out of his players. “Being deeply involved in these organizations and activities has enabled me to grow significantly as a leader and become an active member of the University,” says Pitt student Ali Marinari. “If my science dies in a drawer somewhere instead of helping people, it serves no purpose,” says cardiologist Samir Saba. Pitt has a robust network of resources to bring science like Saba’s to the market. Necrosis—the premature death of cells in living tissue—was long thought to be chaotic and irreversible, until two Pitt scientists found a protein that could halt and control the process. Imagine a robotic arm controlled by people’s brain impulses or a bicycle built for a person with only one leg. Pitt researchers are turning these tech dreams and others into reality. In Malawi, the average life expectancy is 41, and 14 percent of the population is infected with HIV/AIDS. Resolving this crisis is one goal of Pitt’s Student Leaders in International Medicine (SLIM). Submitting to a dentist’s pick or drill can intimidate even the healthiest patients. For people with chronic muscle spasms, say, or problems with blood clotting, it can be out of the question. “I want to see Pitt nursing students practice around the world, and I want nursing students from around the world to come here to Pitt,” says Pitt School of Nursing professor Ann Mitchell. Pitt has won nine national football championships—the most of any major college program in the East, and the sixth-highest total ever. “We are preparing students who will become leaders in the profession, contributing to the advancement of health care and the profession itself," Pitt School of Nursing Dean Jacqueline Dunbar-Jacob says of her school. Following the 2001 anthrax attack at the Hart Senate Office Building, hazard teams needed to sterilize the offices. To do so effectively, they asked Pitt School of Pharmacy Professor Emeritus Joseph Knapp for advice. From alleviating lower-back pain to examining aging’s effects on posture, Pitt physical therapists seek to help people of all ages overcome movement, function, and mobility challenges. Many congenital defects remain internal, but craniofacial ones manifest as deformities like cleft lips and palates. Pitt researchers hope identifying causes of such defects will help prevent them. One challenge for modern medicine is translating laboratory discoveries into medical cures. Pitt’s efforts in translational science fast-track research to practice. From better understanding how tumors develop to finding novel methods of treatment and prevention, Pitt has long been at the forefront of cancer research. “As the nation continues to recover from an economic downturn, there has never been a better time to reexamine and correct racial inequalities,” says Pitt School of Social Work Dean Larry E. Davis. Yes, a computer beat humans on Jeopardy! And that hurt. But get over it. Pitt scientists are studying how computers can be useful allies, too—helping us to explore language, learning, and the law. Adolescents seek thrills and experience emotions with an intensity adults often find hard to fathom. Pitt researchers in the emerging field of developmental neuroscience aim to try. “I learned things that I wouldn’t have been able to learn in a classroom environment,” Mauricio Achata (LAW, MBA ’08) says of the independent-study project he completed while a student at Pitt. It sounds like a magic trick—performing complex, dangerous brain surgery with no incisions, and without touching cranial arteries and nerves. At Pitt, it’s no illusion. Pitt’s immunology research dates back to Jonas Salk’s war against polio during the 1950s. Today, the University’s immunologists focus on organ transplantation, HIV/AIDS, and cancer research. Besides doing scholarly research, Pitt music and theatre arts professors perform, produce, and direct. And they’ve founded some of Pittsburgh’s liveliest arts organizations. From Nobel laureates to MLA award-winning academicians, many talented and critically acclaimed authors have been published by the University of Pittsburgh Press. There is no pressing, real-world question the humanities don't have something to say about, observes John Beverly, Pitt Distinguished Professor Hispanic Languages and Literatures. Established in 2008 as part of the Department of History, Pitt's World History Center studies the worldwide quilt of peoples and ideas that are linked across space, region, and time. Boxers working their speed bags don’t think, "Throw the left. Now, the right." Punching becomes wired into their muscle memory. Pitt neuroscientists want to know how that process works. Margaret and Stella Stein were the first women admitted to Pitt as full-time students, in 1895. They tied for first in their graduating class, launching a tradition of achievement among Pitt women. “The rise of China, simmering tensions between India and Pakistan, and a burgeoning nuclear rivalry between Israel and Iran give geopolitics a new edge,” notes Pitt professor Phil Williams. In 1981, a Pitt microbiologist examining blood from a patient realized he'd never seen such a baffling case before. Some unknown virus was inexplicably killing people, especially gay men. There is more to Pitt than academic achievement and groundbreaking research. An impressive variety of art graces the Pittsburgh campus. Infectious disease. Global warming. The world economy. All are immensely important, and knowledge of all three can be advanced through computer simulation. Who invented the banana split? Or the Nerf football? Who bred the horse that won the 2007 Kentucky Derby? Pitt alumni, that’s who. And those aren’t the only cool things they’ve done. “Mr. Yuk is mean. Mr. Yuk is greeeeen.” Those were the opening lyrics of a 1971 commercial jingle about the scowling green face that warns children not to consume toxic household chemicals. Whether they’re exploring the furthest reaches of the cosmos or the mind of Albert Einstein, Pitt scientists are developing a better understanding of the fundamental laws of the universe. Chancellor Mark A. Nordenberg's predecessors include distinguished chief executives under whose leadership Pitt's campus, academic mission, and reputation flourished. Doctors are bombarded with inducements—from free lunches to complimentary samples—offered by companies selling drugs, medical devices, and services to health care providers. Whether they’re measuring light, radio waves, or chemicals, scientists have developed sensing devices that warn of impending danger. Glenn Scobey “Pop” Warner coached at Pitt from 1915 to 1923. Under his command, the Panthers burgeoned into a national power in college football. “This is a great day for the University of Pittsburgh,” Chancellor Mark A. Nordenberg said on Sept. 18, 2011, the day Pitt was introduced as a member of the Atlantic Coast Conference (ACC). In 1973, a skinny freshman named Tony Dorsett began a Pitt career that would lead to a national championship, the Heisman Trophy, and acclaim as the greatest running back in college football history. Before he gained fame as an NFL player and head coach, ESPN studio analyst, and national spokesperson, Michael Keller “Iron Mike” Ditka Jr. was an All-American tight end at Pitt. Meet Pitt leaders, innovators, healers, and entertainers who have received national and international recognition. Learn about the lifesaving work of Pitt faculty and alumni Philip Hench, Niels Jerne, Maud Menten, Peter Safar, and Jonas Salk. Explore the discoveries and thought leadership of John Brashear, Mary Edmonds, Reginald Fessenden, Charles King, Samuel Langley, and Wilfrid Sellars. See the construction of the Cathedral of Learning and other Oakland landmarks, as well as an overview of Pitt’s growth in reputation. Learn about the founding of the University of Pittsburgh by Hugh Henry Brackenridge and its early history. Growing up in Pittsburgh’s working-class Manchester neighborhood, with little interest in school, Bill Strickland seemed headed nowhere. Then a ceramics teacher taught Strickland to throw pots. Always curious, young Paul Lauterbur often could be found in his high school’s chemistry lab conducting experiments. Later in life, his research in imaging technology would earn him a Nobel Prize. When Herbert Boyer encountered the DNA molecule as an undergraduate studying biology and chemistry, it was love at first sight. A Pitt grad served as acting prime minister of the Libyan rebel government during the 2011 civil war that drove Moammar Gadhafi from power. The prefix nano signifies a billionth: A billionth of a second is a nanosecond, a billionth of a meter is a nanometer. At Pitt, researchers are revolutionizing science through nanotechnology. Founded by Pitt law professor Bernard Hibbitts, JURIST has grown from a small Web site for law professors to an award-winning news and research service read by more than 100,000 people every week. Thomas Carlyle famously called economics “the dismal science.” Experimental economists at Pitt are proving him wrong. As “green” products appear with increasing regularity, Pitt researchers are reexamining what it means to be environmentally friendly. From inserting titanium implants into bones to repairing torn ACLs in knees, Pitt orthopaedic surgeons keep medicine moving forward (or sideways, or rotationally, depending on the joint). In the 20th century, the amount of archaeological research conducted throughout the world surged. At Pitt’s Center for Comparative Archaeology, the goal is to turn raw data into knowledge. Nuclear and magnetic imaging techniques have revolutionized the ways doctors see inside patients’ bodies—without surgery. Pitt radiologists are seeking still-better ways. As proteins develop, the amino acids that comprise them fold—a twist here, compression there. How proteins function depends on their structure. Pitt structural biologists study the folding process. Tiny viruses called bacteriophages are the most numerous creatures on Earth (an estimated 10 quadrillion quadrillion inhabit the planet) and are the focus of several groundbreaking research projects at Pitt. To better understand what causes congenital defects in the heart and musculoskeletal system, Pitt biology professors are studying life as it develops in the womb. Every second, in each human chromosome, billions of DNA strands replicate themselves. Every replication error contributes to aging and disease. Pitt scientists seek to minimize these errors. Pitt writers have won some of the most prestigious literary prizes in the country. They’ve also contributed to Pittsburgh’s growing community of writers through programs like the Pittsburgh Contemporary Writers Series and Cave Canem. Business professor Carrie Leana and psychiatrist Jules Rosen study a paradox: 90 percent of direct-care workers say they believe their work makes the world better, yet turnover in the caregiving industry is high. What’s the difference between learning and education? Are exams the best way to measure either one? To answer these and other questions, Pitt researchers are thinking outside the classroom. Pitt’s Center for International Legal Education (CILE) encourages law students to gain new perspectives on the law and their lives through international research. Pitt researchers have developed a new way of diagnosing Alzheimer’s disease that offers hope for more timely treatment of this most common form of dementia. Located at the edge of D.C.’s Foggy Bottom neighborhood, the University’s Washington Center connects Pitt students to the nation’s capital, offering internships, videoconferencing, and job contacts. Working with some of the smallest particles known to exist, Pitt physicists are looking to make big changes in the way we live and how we think about the world. What Do Zebrafish Tell Us About Humans? What’s the best way to study hearts, brains, and kidneys? Some Pitt researchers begin by watching them grow. If the brain’s pleasure center were an engine, dopamine would be its gas. Scientists suspected the chemical messenger might be the root of addiction. Pitt is hot on its trail. How did the elephant get its trunk? What are the origins of gender? Evolutionary biologists tend to ask fascinating questions, and those in Pitt’s biological sciences department are no exception. By the time he entered his senior year in Pitt’s Swanson School of Engineering in 2011, Micah Toll had invented a kit to test for toxins in imported Chinese drywall. Anything—grandma’s fresh cookies or the scent of an ex-lover’s perfume—can trigger a memory, but Pitt neuroscientists want to discover precisely how memories get made. By examining how the brain processes auditory stimulation—and thus how hearing works—Pitt neuroscientists are gaining insight into the underlying precepts of communication, speech, and language. How does a middle-school teacher interest students in the study of William Shakespeare, Charles Darwin, and Rachel Carson? In 1829, a Black man sat outside a classroom, listening to a teacher offer lessons to White students inside. Because of his color, he wasn't allowed to sit with the rest of the class. Each autumn, Pitt becomes a playground/workshop for some of the best scientific minds in the business. Thomas P. Detre left Yale University to come to the University of Pittsburgh School of Medicine in 1973. By his retirement in 2004, Detre had helped to transform the school and UPMC into titans. Since 1970, internationally renowned musicians—Art Blakey, Dizzy Gillespie, and Sonny Rollins among them—have converged on Pittsburgh each November for the Pitt Jazz Seminar and Concert. As recently as the 1980s, many physicians dismissed postpartum depression, among other women's mental-health issues. Doctors at Pitt, including Katherine Wisner, vowed to change that. Saturn’s rings became clearer to human eyes, thanks to John Brashear, self-taught astronomer and acting chancellor of the Western University of Pennsylvania (now Pitt). Cell phone users wouldn’t be able to talk, text, or listen without the groundwork laid by Pitt researcher Reginald Fessenden, whose experiments led to the first wireless phone. America's first professional songwriter, Pittsburgh-born Stephen Collins Foster crafted songs—including “Beautiful Dreamer" and “My Old Kentucky Home"—that are loved around the world. At its peak in the 1940s and 1950s, polio was killing or paralyzing more than a half-million people worldwide each year, especially children and young adults. The “lucky” survived to walk on crutches. Before Peter Safar made his mark, emergency medicine focused on wounds and broken bones, not bringing the dying back from the brink. Nearly every living organism sleeps, but the mechanisms underlying sleep remain elusive. Pitt scientists are trying to change that by studying circadian rhythms and sleep-related disorders. From making coal cleaner to finding new uses for solar power, Pitt’s Center for Energy carries on Western Pennsylvania’s legacy of innovative thinking about energy. By 1787, Hugh Henry Brackenridge—not yet 40 years old—had risen from poverty to earn success in Western Pennsylvania as an attorney, author, Continental Army chaplain, editor, and educator. When the University acquired a fossil-rich ranch in Wyoming in 2005, it continued a tradition of Pitt research on dinosaurs that dates back more than a century. Whether it involves solving a 400-year-old problem or understanding neuronal activity in the brain, math at Pitt combines classical and applied mathematics to open new frontiers. Think of this site as a virtual coffee-table book celebrating Pitt’s 225 years of building better lives. Like any good coffee-table book, it is meant to be savored and revisited. Browse through more than 225 stories about today’s Pitt and yesterday’s. Start with your favorite category or explore by topic. For other options in navigating, visit our Help page.